From the stop light on Kelly Street at the southern end of Half Moon Bay it is six miles south to Verde Rd. There are three Verde Road exits and it is easiest to take the second. The first Verde road exit is marked on Highway 1 at the 3 mile point. Go past this. One mile later, and the first left after you see Bob's Vegetable stand, is the turn off for Verde #2. Verde #2 follows an intersection sign and there is a "call box" right before the left hand turn. Follow the arrow and bear right up the hill 250 yards. The road splits. 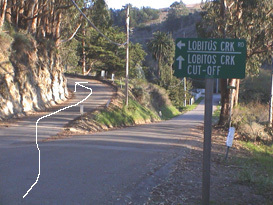 Take the left fork up Lobitos Creek Road. Follow Lobitos Creek Road on up 2.8 miles and the ranch is on the right across from the first set of mailboxes on the left. When you see the palm tree you've arrived.